In this trip you get to know the versatile, beautiful countryside of Nepal and take part in different sports activities as well. Upon your arrival at Tribhuvan International Airport (TIA) in Kathmandu, a representative from our organisation picks you up and transfers you to your hotel.. In the evening you have a welcome dinner and your guide provides you a detailed briefing on your upcoming tour so that you are well prepared for the trip and any last-minute question is answered. In the morning you have 2 hours language and culture class. During that time you learn the most important words and small sentences of the language and some cultural rules, which you should follow during your stay there. After lunch you drive to Swayambunath, the "Monkey Temple" of Kathmandu, a buddhist place of pilgrimage with a small Stupa. There are many monkeys bopping around, so you should keep hold of your camera, mobile and other things, that the monkeys are not able to grab them with their speedy fingers. Then we go to the touristic center of Kathmandu, Thamel. There are innumerable shops, cafes and restaurants, a great place for shopping some souvenirs or gifts for your family at home - if you bargain good, the price will be very cheap. After a homy breakfast in the morning we drive to Pashupatinath. It is an important place of pilgrimage for Hindus located at the small river Bagmati and every week come many pilgrims from whole Nepal, India and other parts of the world to pray and give sacrifices to god in the temple. The temple of shiva is one of the most important of the indian subcontinent. In the evening we visit Bodhnat, also known as "small Tibet". There you can view the biggest buddhist stupa of the world and run across a lot of tibetan people who circle the stupa, spin the prayer wheels and mumble prayers. Enjoy the unique atmosphere there. In the evening we drive to Sundhara by taxi, to the big shopping malls and visit the cinema there. You can decide if you want to watch a movie in english or a bollywood movie, which is only available in hindi. Afterwards you drive back to your hotel. Today we drive to Chaurandi, the starting point of our whitewater adventure. Our experienced guides give us important informations and after putting our life jackets on, we move the boats in the water and start our trip. After arrival in Kuringhat we build our tents up because today we stay overnight in tent. After short time wildwater rafting and reaching Ghaeghat, we continue or ride to the south of Nepal, Chitwan. The landscape surrounding us is now fully different than before. We are next to the jungle now, face elephants with their Mahouts (elephant guides) on the street and view crocodiles in the river sometimes. After taking rest or discover the surrounding area of our hotel, we drive to the Tharu Culture Dance house, where we visit a dance presentation. 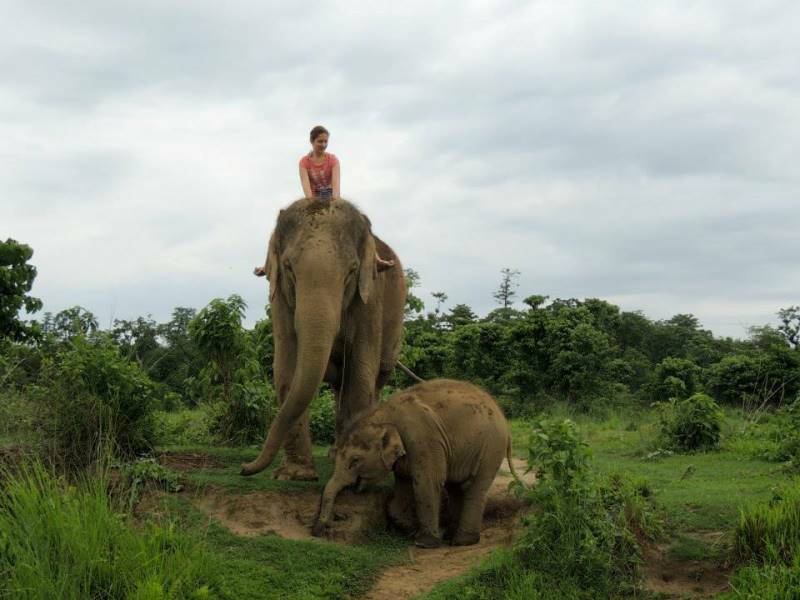 Today you have the whole day to explore Chitwan. After having lunch you have a canoe ride along the Rapti River. An excellent opportunity for bird watching and for looking at the 2 species of crocodiles here; the Marsh Mugger and the fish eating Gharial very close to you. After that you will have a short jungle walk which leads you to the Elephant Breeding Center. In the morning we drive about 5 hours to Pokhara. If you have good weather you have good views of Manaslu, Lamjung and the Annapurna range even from the bus. Pokhara is located next to Phewa Lake and offers a great view of the Himalaya. After having lunch you have free time to go shopping at the lakeside with its numerous small shops, or you can make a boatstrip. In the evening we have time to prepare for the short trek. In the morning we leave all luggage which we don't need the next days in the hotel and start our short trek. First we drive about 40 minutes to the starting point, from there we walk by foot to Dhampus. The highest point today is the Australian Camp with 2100m. During the trek as well as from Dhampus we have a fantastic view of Machhapuchare (7000m) and the Annapurna Range(8100m). In Dhampus is also a small farm with about 40 cows. There the people produce cheese, herbage and honey. If you like, you can not only look how they do it, you can also try yourself, to experience how it is. In addition there are many view points to which you can hike up and get more great views of the Himalaya. Today we get up early to marvel at the sunrise behind the high mountains. After breakfast we continue our trek about 4 hrs to Sarangkot, a view point near to Pokhara. 1. You can book paragliding (starting point Sarangkot; 30min approx. $80) and fly above the lake down to Pokhara, where you land next to the lake. It is a tandem flight, so you don't need any precognition. After 3 steps you are in the air and enjoy the view of the Annapurna Range and many other more than 8000m high mountains and for sure Pokhara below you. You land beside the lake, from where a car brings you inside the town, where we wait for you. 3. take a taxi to your hotel. After time for changing clothes and eating, we go to the lakeside, where we take a boat to the other side. From there we walk about 200 meters up tp World Peace Pagoda. From there you have a fantastic view of the mountains, the lake and the town. Today we drive about 7 hrs back to the capital Kathmandu and from there further to the ancient kingdom Bhaktapur. If you want, you can explore the surroundings of your hotel by foot, but it will be late, so we start sightseeing not until the next day. After breakfast we explore the ancient kingdom Bhaktapur together with your guide. The gorgeous temples and artful woodcraft remind us of the past. In the evening you eat all together and enjoy the last evening. If you like you can also try traditional clothes like sari. If you don't want to extent your trip with a longer trek, other sightseeing, volunteering etc. you are transferred to the airport and fly back to your home country with a lot news to tell and many, many great experiences, which you will never forget. This Adventure Round Trip combines sporting activities like rafting and trekking with sightseeing in all regions of Nepal. It starts in Kathmandu, followed by Chitwan, Pokhara, Dhampus and Bhaktapur.